China is now experiencing the largest mass migration of people from the countryside to the city in history. An estimated 250 million Chinese---a number equivalent to two thirds the population of the United States or three times the number of people who emigrated to American from Europe over a century---have left the countryside and migrated to the cities in recent years. About 13 million new people join the legions every year. The number is expected to surpass 300 million and maybe reach 400 million by 2025. 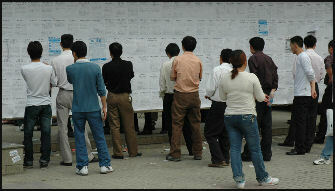 According to 2010 census figures China's migrant population now numbers 221 million, or 16.5 percent of all citizens. A government report issued in 2011 said more than 100 million more farmers would move to urban areas over the next decade. Between 2000 and 2010 an estimated 116 million people from China's hinterlands migrated to the booming coastal cities in the hope of finding better lives. Although they are a source of great social upheaval in the villages and cities migrant workers keep villages going that might otherwise die by providing relatives back home with money and they keep cities going by providing the cheap labor that fuels economic growth.Some have described the migration of workers in China as the largest peacetime movement of humanity ever, dwarfing the Irish and Italian migrations to America (the entire Irish migration to America between 1820 and 1930 was around 4.5 million people) and the fleeing of refugees from places like Afghanistan and Kosovo. The "floating population" is defined as people who live apart from their domicile as defined by China’s stringent hukou or household registration system. So many migrants leave their homes looking for work they overburden the rail system. In the Hunan province, 52 people were trampled to death in the late 1990s when 10,000 migrants were herded onto a freight train. To stem the flow of migrants, officials in Hunan and Sichuan have placed restrictions on the use of trains and buses by rural people. The migration is all the more extraordinary when one considers that the government has tried to restrict it. One young girl told National Geographic, “All the young people leave our village. I’m not going back. Many can’t even afford a bus ticket and hitchhike to Beijing." Overall, the Chinese government has tacitly supported migration as means of providing labor for factories and construction sites and for the long term goals of transforming China from a rural-based economy to a urban-based one. Some inland cities have started providing migrants with social security, including pensions and other insurance. Migrant workers looking for work A significant portion of China's urban dwellers are migrant workers. A national census published in April last year showed China counted more than 221 million migrants, and a government report released months later predicted that more than 100 million farmers would move to cities by 2020.According to recent census data, about 7 million migrants live in Beijing, making up roughly a third of the city's population. The labor of Beijing’s migrant workers has been essential to building the city. People with skilled jobs such as welders on high rises get paid $280 a month. Sociologists call the migration to the cities the "bright lights effect." In most cases village men head off to cities to find work, leaving their wives and children behind to raise the children and take care of their land. The men often get menial jobs and send the money back. After a man establishes himself in the city he is joined by his wife and children, then nephews and uncles and other extended family members, who in turn establish themselves and are joined by their families and extended families. The poorest of the poor usually don't migrate to the cities or abroad, rather its people that can scrape together some extra money for the trip. Some people move to the cities to seek a better life. Other have been driven off their land as a result of soil depletion, erosion or disasters. Chinese sociologists say many families would rather brave the uncertainties and the difficulties of life in the cities than return to their rural hometowns, where opportunities are in short supply. "They're just moving from one place to another," one said. "Very, very few of them go home." These days fewer and fewer plan to return to their villages in retirement. M any younger migrants have little experience of farming, and believe their futures lie in towns. "[Urbanisation] is better than an economy without growth. But when you grow, you also have to provide services to [migrants] and not only use them as cheap labour---You need children to move with their parents to cities and you need services for the left-behind elderly," Tao Ran, an expert on rural affairs at Renmin University, told the Guardian. Migration to the cities has been described as “the most effective way for reducing the birthrate” and improving life. The poor generally have better access to education, health care, safe water, sanitation in the cities than they would in the countryside. The World Bank has called migration “a powerful force for poverty reduction.” In 2005, 200 million migrants around the world sent home $167 billion. That is twice the size of the world’s development spending, and up from $31 billion in 1990. Many migrant workers---especially the younger, so-called second generation---are increasingly frustrated with the treatment they receive, and the issue has in some cases sparked violent unrest. In June 2011, three days of riots broke out in the southern province of Guangdong after rumours spread that police had beaten a street hawker to death and manhandled his pregnant wife. Between 2000 and 2010 the eastern coast’s share of the population increased by 2.41 percent to reach 37.98 percent, while that of the western and central regions declined respectively by 1.11 percent and 1.08 percent to reach 27.04 percent and 26.76 percent. With 104.30 million people, Guangdong is now the country’s most populous province. That honor used to belong to Henan. With 94.02 million people, the central province has dropped to No. 3, behind coastal Shandong, which boasts a populace of 95.79 million. "I can't read or write; I can't even speak standard Mandarin well. We don't want our children to be like us," says Chen. Migrant workers build China's cities, clean their homes and clear their rubbish---but other residents "call us beggars and use dirty words," added Wang. As with its former growth spurts, the city's current boom would not be possible without an influx of foreign investment---and armies of migrant workers. Of Shanghai's 20 million people, a third are migrants without residency permits and some associated benefits. Many of these waidiren---outsiders---live in well-established communities, some with their own private schools to accommodate children whose unofficial status bars them from public education. Others, like Chen, form a floating population on the lowest rung of Shanghai society. In Shanghai's early days most migrants became part of the culture, living in lilong and learning the local dialect. Today, in an era of easy travel and communication, such assimilation is rare. Chen has worked in Shanghai for two years, but he's never considered staying permanently---and he hasn't learned a word of Shanghainese. 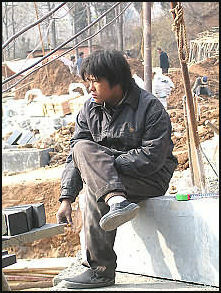 Most of his wages go to his family in nearby Jiangsu Province. At the end of his walk down Nanjing Road, Chen heads into the workers' "dormitory"---plywood rooms on the third floor of an unfinished high-rise. Across the street is the 22-story Park Hotel, the tallest building in Asia when it went up in the early 1930s---and a symbol of Shanghai's earlier global pretensions. It too was built by migrant labor. Chen may not be welcome in Shanghai during Expo 2010. In those six hallowed months, construction will halt, and most contract workers will be sent home. But Chen will be back. "As long as Shanghai keeps growing," he says, "it will always need people like me." Some migrants from Sichuan in Beijing earn around $50 a month sifting through garbage dumps for recyclable materials. Factory workers work 14 hour days, 7 days a week for between $40 and $120 a month (See Labor). 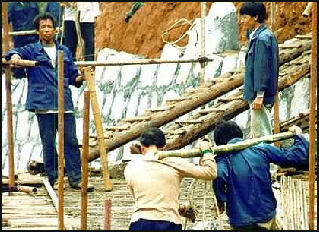 Migrant construction laborers are paid around $1.25 a day, a wage that is pitiful by Western standards but much higher than what they can earn their home provinces. Some are promised wages of $1.72 a day but end up getting only 57 cents. The average migrant earns $100 a month and sends about a third of it home. Families with at least one migrant worker are almost automatically lifted above the poverty level of $1 a day. Migrants send home around $45 billion a year. Some send four fifths of their incomes to their families. This money is vital to keeping the rural economy going, allowing families to move into new, better homes, send their kids to school, and buy things like livestock, home additions, a plow or tractor, or a big-screen television. The phenomena is similar to that of migrants who go abroad to seek opportunity except that no borders are crossed. The money also helps get local and national governments skirt their responsibilities of providing villagers with social services. Some workers do not know how much they get paid and go years without receiving any money. They work 12 hour days, seven days a week, and receive room and board in a cramped dormitory, daily rations of rice and noodles, and $12 a month in spending money, with money docked from their pay of they are sick. Some bosses arbitrarily declare work substandard and deduct money from their pay. Often migrant workers are not paid until the job they are working on is completed or until they return to the work site after returning home for the New Year holiday. This practice is done so the worker’s don’t work for a month a then leave. But some employers abuse the arrangements and tell workers they will get paid after they work a few more weeks and repeatedly deny them their pay. There have been cases of workers working for two, three even ten years without getting paid. Even under these conditions new workers keep coming because opportunities in the villages are so limited. Expectations among migrant workers are rising. Li Changping, a researcher and advocate for farmer’s rights, told Reuters, “These migrant workers carry expectations about building a home, getting married, having children, becoming successful, and there’s a real pressure from trying to keep up.